Buckle up: this year’s influenza virus (flu) is a doozy. Every year, the U.S. Centers for Disease Control (CDC) tracks how widespread the flu is in each state. And this year, for the first time in 13 years, flu activity is “widespread” across the entire continental United States; only Hawaii has escaped the 2017-2018 flu season. This year’s flu features the H3N2 strain of the influenza A virus, which is more difficult to treat and deadlier to vulnerable populations, like infants and people over 65 years old. H3N2 is also much more difficult to prevent with the flu vaccine. The CDC reports that “flu vaccines provide better protection against influenza B or influenza A (H1N1) viruses than against influenza A (H3N2) viruses,” with average vaccine efficiency of only 33 percent against H3N2 viruses, compared with 61 percent efficiency against H1N1, and 54 percent against Influenza B. So does that mean you should just skip the flu vaccine? Absolutely not! Even if it’s only 33 percent effective, it will help you to reduce your chance of getting the flu by one third? If you haven’t gotten your flu shot yet, it’s not too late; flu seasons can often stretch into May, and the CDC is starting to see more strains of influenza B and H1N1 show up as well. So run, don’t walk, to your nearest pharmacy to get this vaccine. You can also boost your immune systems with heathy choices from USConnect’s fresh meals, snacks, and beverages. Look for antioxidant-rich foods like spinach and blueberries, or vitamin C-rich citrus. Drink plenty of fluids; get plenty of rest, and hopefully you can avoid the flu when it comes knocking. If you’re like 41 percent of Americans, you made a New Year’s resolution this year. And if you’re like 21 percent of Americans, your New Year’s resolution had to do with losing weight or eating healthier. 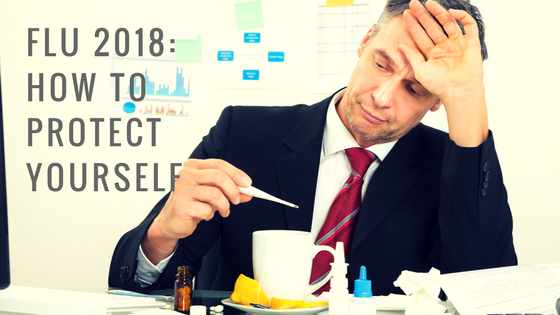 Unfortunately, if you’re like 91 percent of Americans, you will not be successful in fulfilling your resolution. While there are many factors that contribute to a person’s success or failure in achieving his or her goals, one way to improve the chances of success is to change the goals themselves. Someone whose goal is to lose 50 pounds or to only eat salads for every meal is likely to be disappointed by his/her results. If your goals are unrealistic, you’re unlikely to be able to achieve them. 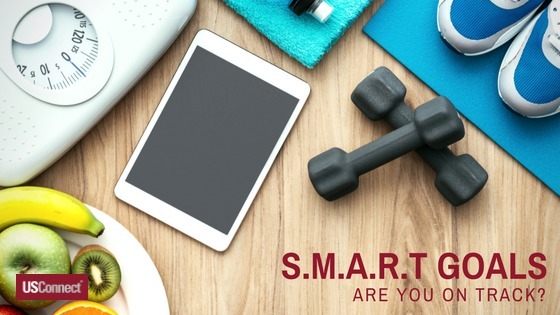 Although the idea of the SMART goal originated in business management in the early 1980s, it provides an excellent guide for nutrition and fitness resolutions. When you set your goals, ask yourself this question: are they SMART? Measurable: Vague goals are easier to ignore. Make sure your goal is something you can measure and record your progress in accomplishing. If you want to get at least 20 minutes of cardiovascular exercise a day, you can keep track of it, especially with fitness trackers. Achievable: This is a big one for nutrition and fitness goals. If fresh food is not easily available at work, then it may be hard for you to eat vegetables three times a day. If you live in a very cold climate, it may not be feasible to walk outside every day, so you should find a way to exercise indoors. Realistic: You need to know your own personality and how you react to challenges. Is it realistic for you to cut out sugar for 30 days, or is that something that will be too difficult? Would it be more realistic to cut down on sugar, like to 10 grams a day? Realistic goals are much easier to keep. Time-bound: Set a time frame for your goal, like for the month of February or the first quarter of the year. Knowing that you have a start and end date will help you do what you need to do to meet your goal. Soup’s On! Welcome to Winter! The 21st of December was the winter solstice: the shortest day of the year. In some parts of the country, darkness falls before 4:00 p.m., and the thermometer rarely reaches above freezing. As we covered in Darker Days, it’s much harder to eat healthily and stay fit during the shortest days of the season. Our bodies respond to the colder temperatures and lack of sunlight by trying to hibernate, driving us to eat more “comfort food” and sleep away the winter. The cold weather and need for comfort during the winter often make us reach for soup. It’s warm and comforting, and it can be a filling meal. However, many soups are loaded with the very unhealthy ingredients we manage to avoid during the rest of the year. 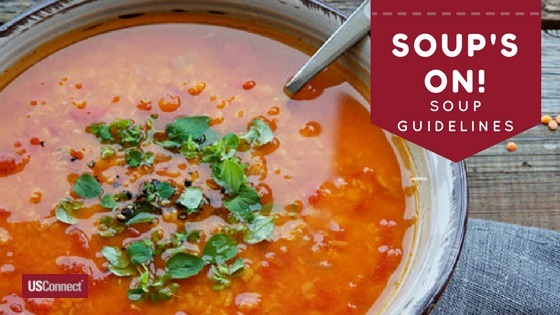 Our soup roundup can help you make the best choices while still feeling warm, full, and comforted. Beware of sodium and monosodium glutamate (MSG). In an attempt to reduce fat and calories, many canned and boxed soups load up on salt and MSG. As part of our The Right Choice…for a Healthier You™ program, USConnect’s registered dietician recommends that an entire meal should contain no more than 575 milligrams of sodium: less if you have high blood pressure. Too much salt can leave you feeling bloated and even affect your kidneys. MSG can trigger migraines, especially in people who are not used to it. Be sensible about fat and calories. Read the label of your soup (or pay attention to the ingredients). If a soup has 280 calories and 12 grams of fat, it’s not a healthy meal. Soups that aim to reduce sodium often do so by adding extra fat and calories. Look for options with no saturated or trans fats and a total fat count of two grams. Protein lasts longer; to keep you going throughout the day, your soup should have at least five grams of protein. If it doesn’t, try adding a half-sandwich, a piece of chicken, or hard-boiled egg. Fiber fills you up. Look for soups with lots of legumes, like beans and peas, to help you feel full and satisfied. Split pea soup, chili, and black bean soup are all good, stick-to-your-ribs choices for cold days. Want to try to make your own? Start with our Bone Broth tips!